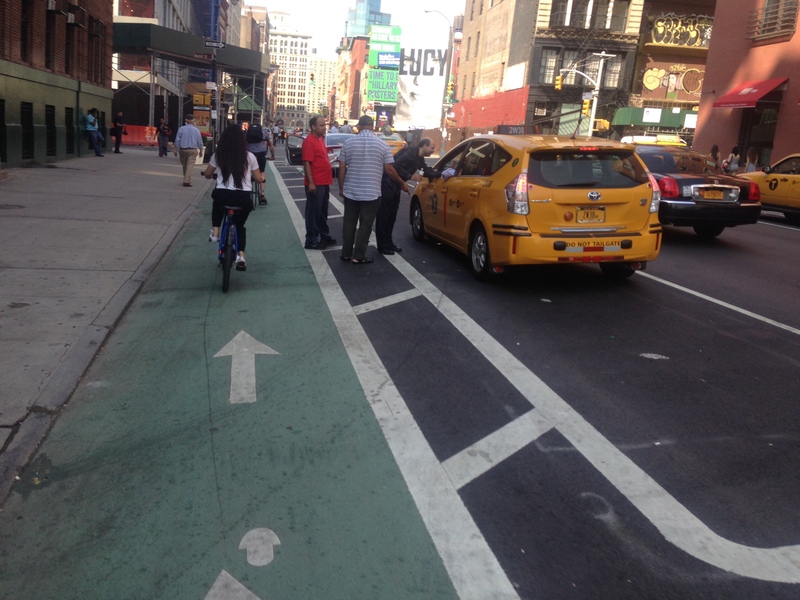 Streetfilms | Why do we need a buffer in Protected Bike Lanes? Well, here’s why…. 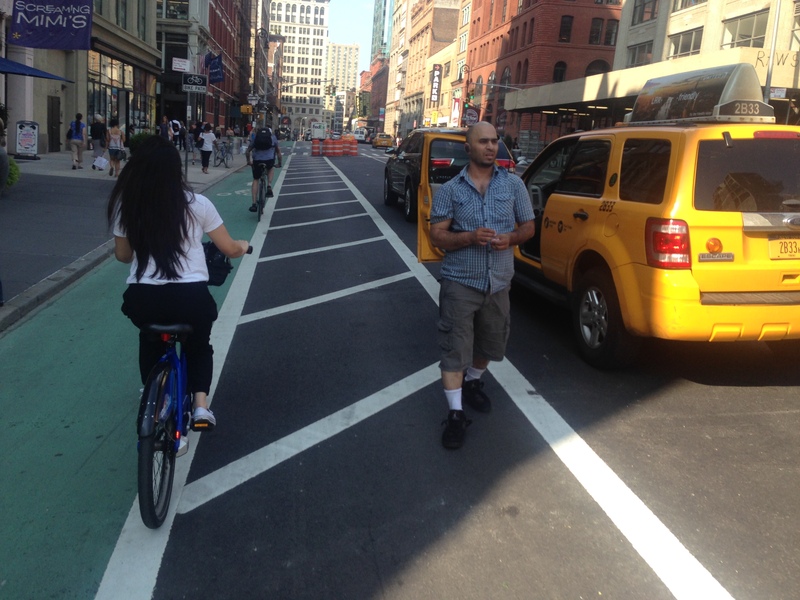 Recently I had a quick exchange with a visiting cyclist who was pleasantly amazed at the "extra" space afforded bikes in most NYC protected bike lanes. He was referring to the painted zone between parked cars and the actual "green" bike lane - amazingly it's not the first conversation I've had like that. And you know if that's true among riders, you can image the consternation of the motorist crowd when it comes to examining why that "extra" space exists. That's one reason I put together the above Streetfilm with Gary Toth many years ago. To explain why it's there and how both drivers & riders benefit from the placement. It's a great resource if you are working in a city or country with a government that doesn't get it. So use it. And to show just how much it gets used, Friday I took the following series of photos during a ten block stretch riding a Citibike. Within less than 3 minutes you'll see exiting drivers, a mom with stroller and taxi drivers just chatting outside their car in the zones, all very typical in NYC. Posted in Bicycles, Streetfilms News. Tagged as buffer zone, cars, floating parking, Gary Toth, Parking, protected bike lane, Streetfilms News. USA is not the good example for infrastructure. There is so much to do that it looks as if the easier way would be to rip it all up and start from the scratch. This is just painting over mistakes, making it LOOK-ALIKE but not WORK-ALIKE. Same with cars, subways, trains..telephones, banks..you name it. I agree, but ripping everything up is simply a non-starter in the vast majority of situations. The real frontier here in America is getting building standards changed so that we get stuff that actually works from the very beginning instead of this horrible infrastructure that requires "look-alike" solutions to be retrofitted onto it. Then, older stuff can be upgraded to the new standards during regular replacement cycles. I've been 'doored' twice in London .. Okay, here's a streetfilm showing something positive going on in the US, and as usual, you guys are ripping it apart. Enough already. Why can't we just celebrate some good stuff for a change? Those aren't protected bike lanes (cycle tracks). 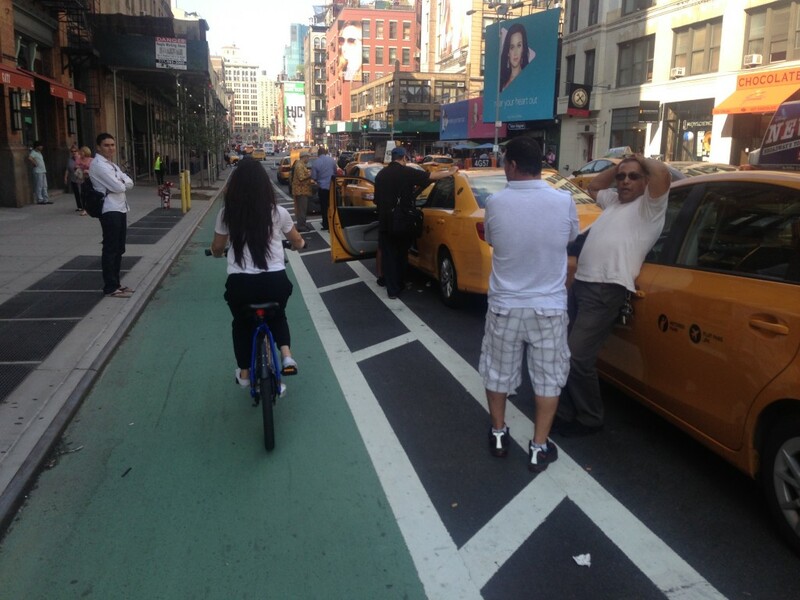 There is no hardware barrier between automobile traffic and the cycling infrastructure. 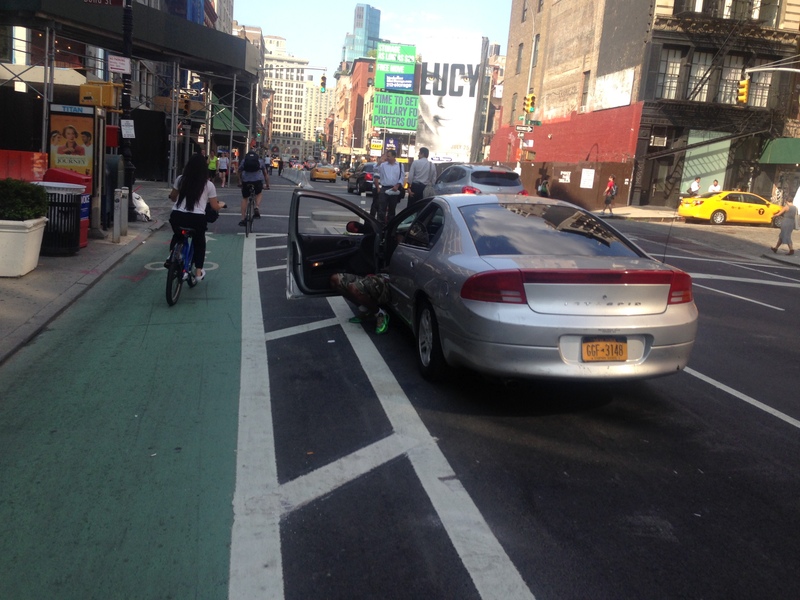 These are buffered, substandard bike lanes with green paint. Notice that there's no gutter pan? Everywhere else, the bike lane is measured 5 feet into the roadway starting from the seam of the gutter pan. Notice that the liquid stains extending out 1.5 feet? Assume that's where the gutter pan would end. PS - The green paint looks pretty crappy after a week, doesn't it? Further proof that it's painted just so the city could have a couple days of photo ops. 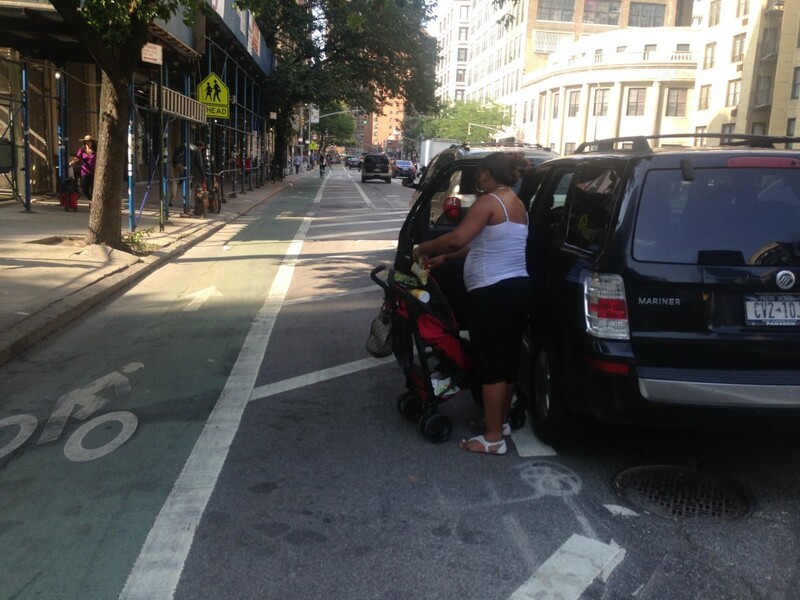 Get the cars off our public spaces. Get the humans back on it. Some humans can ride bikes slowly. That's all.